Combines Tea Tree Oil with gentle conditioners to soften and detangle hair after shampooing. Features and Benefits Suitable for all hair types Contains 100% pure Tea Tree Oil Suitable for sensitive scalps Ideal for use after treatment with Tea Tree Head Lice Gel Directions For external use only. After using Thursday Plantation Everyday Tea Tree Shampoo, rinse well. 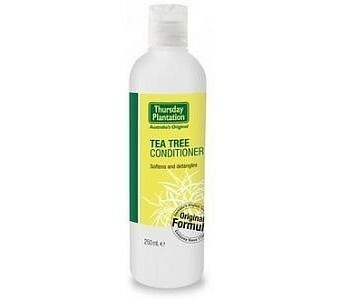 Gently massage a sufficient amount of Thursday Plantation Everyday Tea Tree Conditioner through the hair and scalp. Leave 1- 2 minutes. Rinse thoroughly with warm water. Duration of Use No restriction on duration of use. CAUTIONS AND CONTRAINDICATIONS Discontinue use if sensitivity occurs. Do not apply to broken skin. Keep out of reach of children. Medicine Interactions None known.